We had a beautiful day today.The weather was just right for a walk and that’s exactly what I did. After breakfast,just before Ananya’s nap-time,I put her the pram and went for a walk. I took the big heavy pram on purpose,so as to get extra workout. And as I was walking I realized that the last few times that I walked that way,pushing a pram was,when I was at least 15 if not 20 kgs heavier..and that realization made me feel so good.But it also hit me that I worked SO hard at the beginning of the year all the way till June..and then life got in the way and it was easy to slip into excuse mode. I came back from Brisbane,with a gain of 4 kgs and its been killing me. I started working out with my fab trainer but festivals,broken foot..all came in the way.But when I went back to her on Monday,I felt horrible about falling off the wagon! I have tried to eat as clean as possible,despite cooking all the goodies for the family.That makes me feel a tiny bit better.. I even walked to and back to school for pickup and when I got back home,I felt the good soreness that I actually look forward to after a workout. Ms.Ananya is super cranky this evening,so I’ll wrap up this post.But not before I show you this pic of Canvas Lantern that Ms.Aadya made All-by-herself. My only contribution was cutting in straight lines and covering up the little whites on the left. 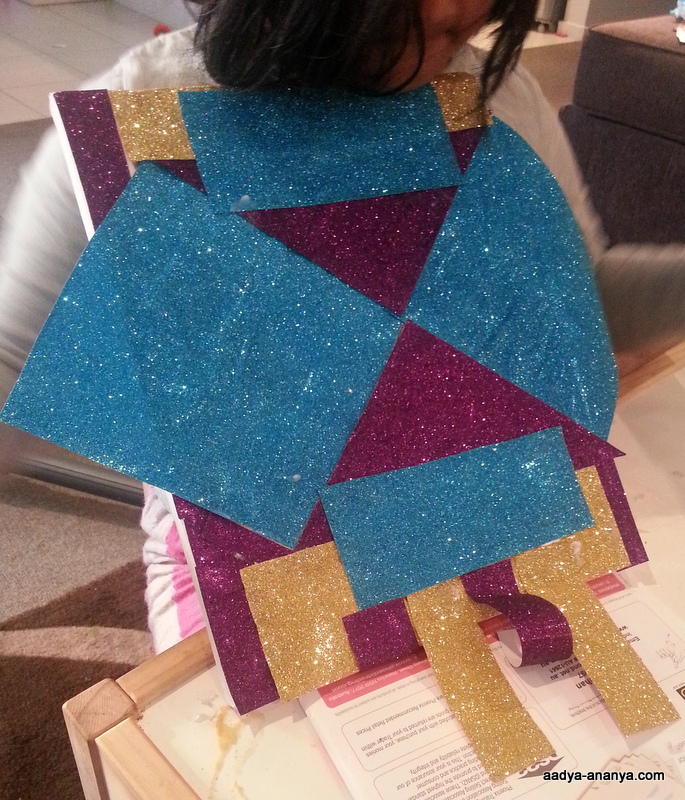 The inspiration behind this-This kandil that Shruti and Li’l P made last year. Thank you Shruti,she had a lot of fun making this!